So another year begins, and seeing as Christmas has just gone you may have some stuff lying about, specifically nuts. We don't normally get nuts in their shells, but this year as I've been making nutcrackers we got a small bag, well I had to test the nutcrackers out. The thing is what do you do with all the shells once you've eaten the good bit? 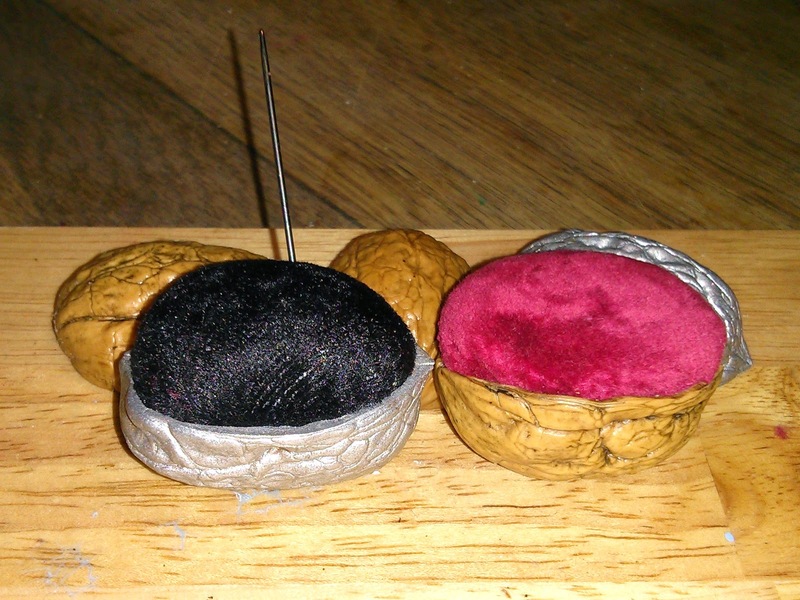 well as it turns out Walnut shells are quite useful for making pin cushions, all you need to do is stuff them with something you can stick pins in. Okay so it's not a new idea, I've recently seen something similar in one of our museums but it is easy to do, and you can put any empty shells you might have to good use, maybe make some for the next Christmas ? 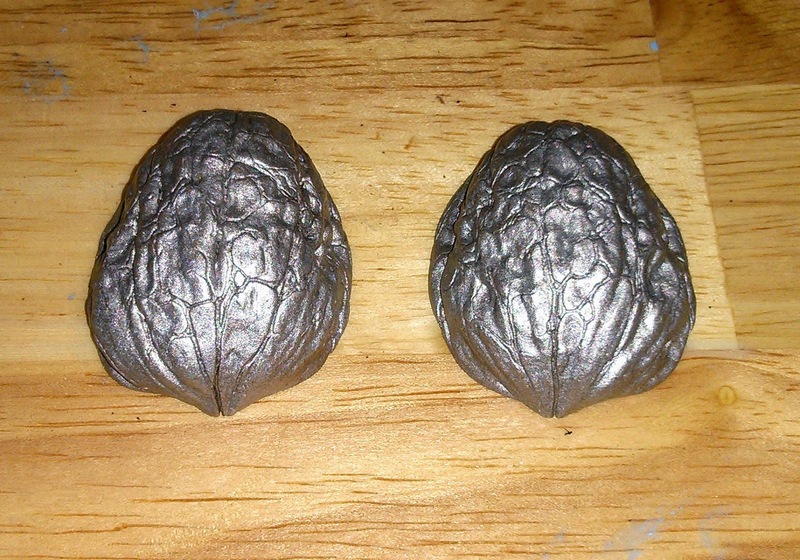 To make these all you need is a Walnut, crack it open, but do it as carefully as possible as you want the shells intact with no cracks, I've found that using a flat bladed knife and prising the shell open works quite well. 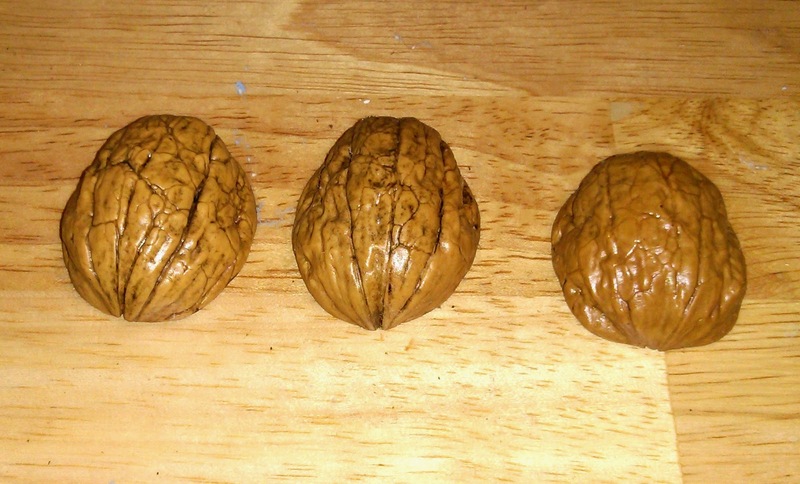 Once you have your Walnut halves if there are any sharp edges give them a rub with some sand paper. Of course you can paint the shells in any colour you like, I've sprayed a couple with silver paint, and then finished them off with a coat of clear lacquer. Once your shells are done all you need to do is make a small cushion and stuff it in the shell, making the cushion is easy, I'm not known for my needle craft skills, but if I can do it anyone can. 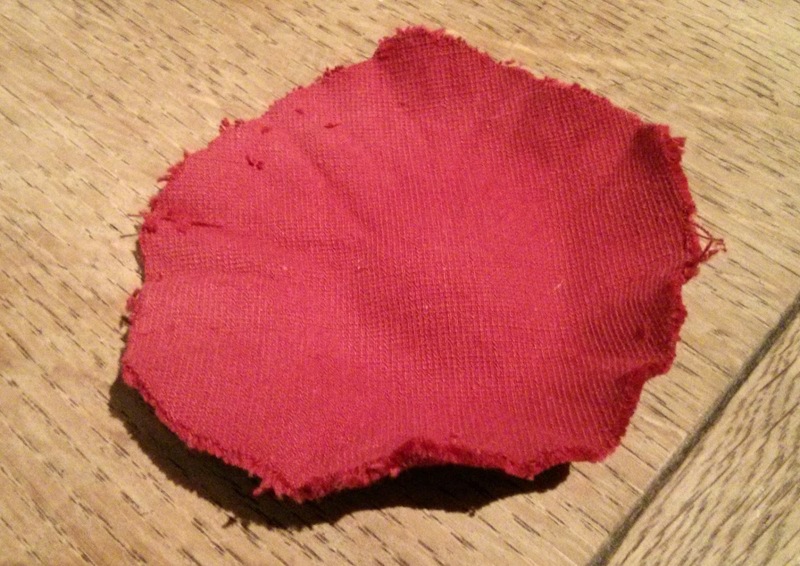 Get a rough circle of material, about 5cm across, I used red and black velvet for each of the two I made, but any small scrap of material will do. I did say rough circle. 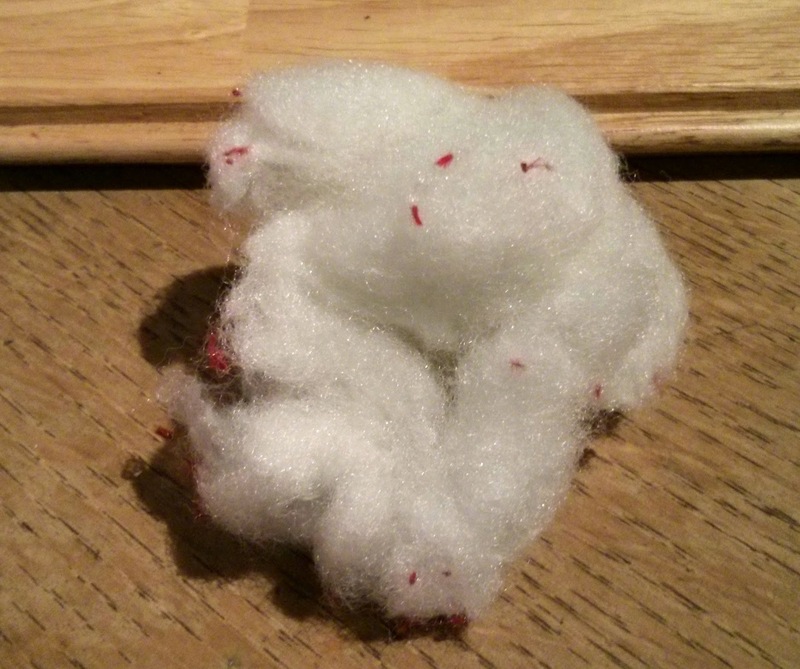 Then I took a wad of stuffing (the stuff you find in cushions and such like) and stuffed it in the middle of the material, then I stitched up the end, so basically what I made was kind of like a draw string bag. I had to trim some off, it was a little big. Should fit a bit better now. 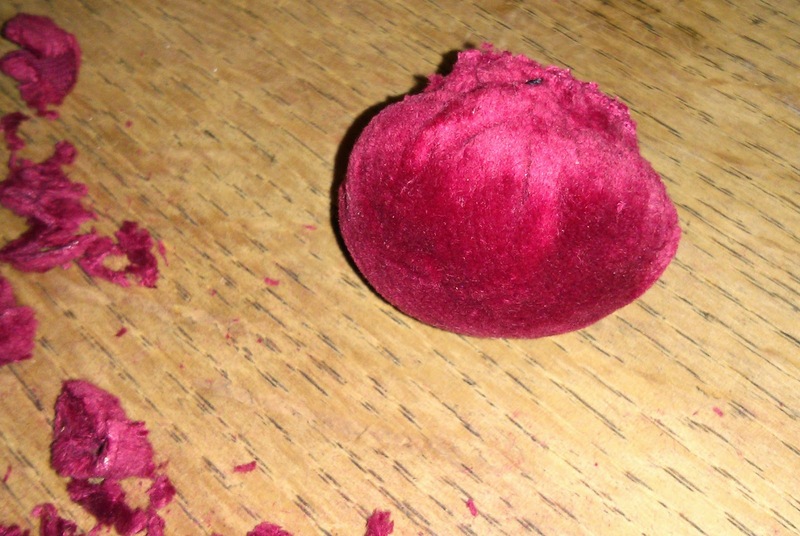 Then all I did was stuff the cushion into the shell, I didn't need to use any glue to secure the cushion, but it would probably be best to use a bit just in case. Simple to make, and a good use of what would other wise end up on the compost heap or in the bin, and they make nice little gifts for people, you could add a bit of Velcro to the bottom so that it can be attached to a wrist band, or a sewing machine, this would also stop the pin cushion rolling about. Great little project for children to help with too. 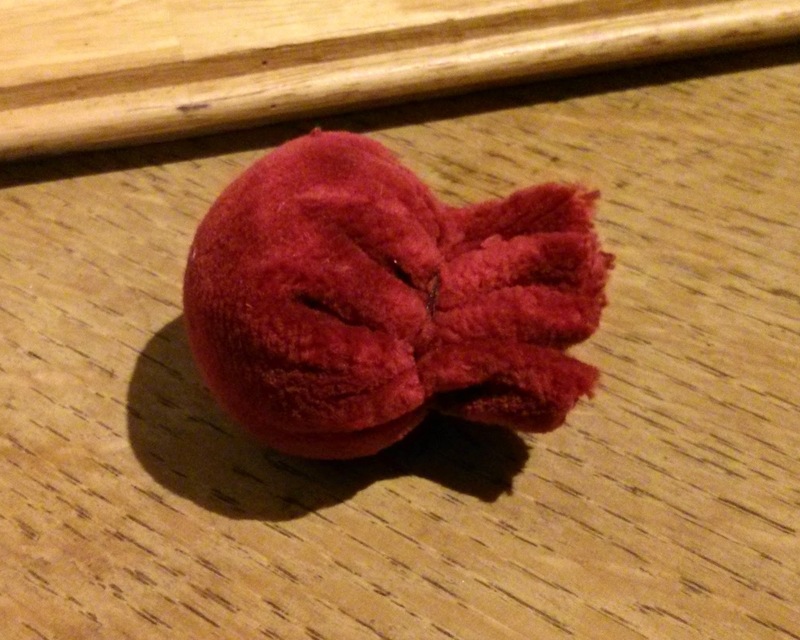 If you drilled two holes in the bottom of the shell then you could sew it to a wristband prior to the stuffing stage. Good idea, must admit I didn't think of that.